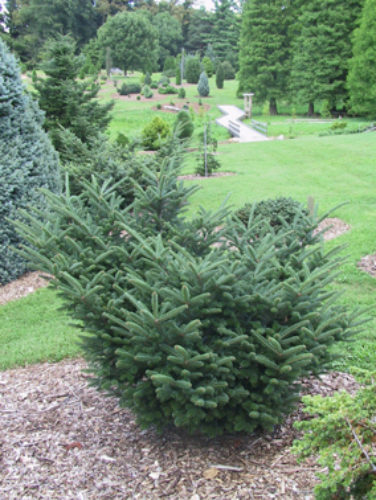 Abies fraseri 'Klein's Nest' is an attractive, compact, low-spreading, densely-crowned selection of Fraser fir. Its needles are glossy green and shorter than those of the type. Seed cones are purple, held upright on the branches. Typical rate of growth in most areas is to 2.5 to 4 inches (6 - 10 cm) a year, resulting in a spreading shrub, 2 by 3 feet (60 x 100 cm) after 10 years in the landscape. Raraflora Nursery of Kinterfield, Pennsylvania introduced this cultivar around 1970. Although it's origin is unclear, it is speculated to be named for Theodore Klein of Crestwood, Kentucky, a leader of the regional nursery industry and as an educator. 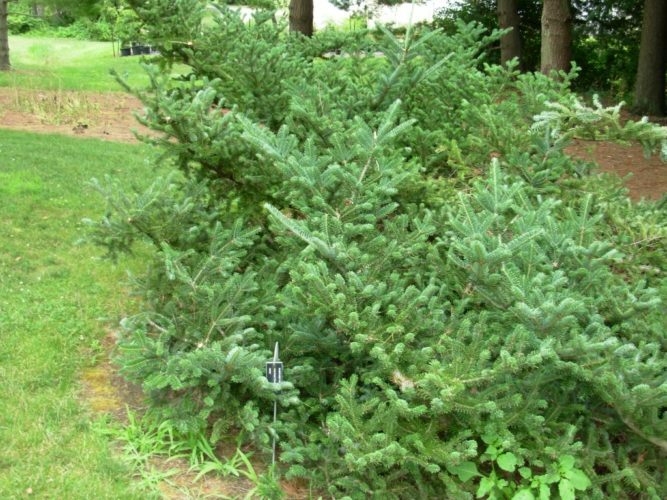 Abies fraseri 'Klein's Nest' — a picture taken at the Dawes Arboretum during the American Conifer Society tour in 2004. Abies fraseri 'Klein's Nest' at Hidden Lake Gardens, Tipton, Michigan, July, 2016.